Ryland Peters & Small, 9781788791229, 144pp. 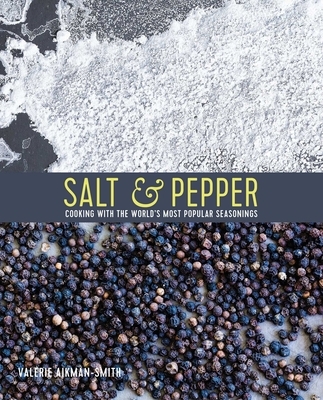 More than 70 deliciously innovative recipes that showcase salt and pepper as gourmet seasoning ingredients, from the aromatic and subtle to the hot and fiery. In this beautiful book, top cook and food stylist Valerie Aikman-Smith introduces you to an amazing array of culinary salts and peppers that will add flavor, depth and panache to your cooking. From French fleur de sel to Indonesian Lampong pepper, sublime seasonings you've probably never heard of feature in more than 70 gourmet recipes. Ideas for small bites, main plates, sides, sweet treats, drinks, preserves and brines, rubs and oils are all featured. Snack on homemade Spicy Popcorn with Chipotle Salt or North African Roasted Chickpeas. Graze on small plates that include Salt Cod Latkes and Peppered Pan-roasted Olives. Enjoy delicious soups from Gazpacho with Smoked Salted Croutons to Peppered Beef Pho, and more substantial dishes such as Crispy Roast Duck with Green Tea Salt, Lemon Pepper Ricotta Gnocchi, Porcini Crusted Ahi Tuna with Yuzu Pepper Dipping Sauce, or Spicy Maple Baked Tofu with Buckwheat Noodles. And to satisfy a sweet tooth, there are surprising treats in store from Peppered Pistachio Nut Brittle and Chocolate Seasalt Cookies to Goat's cheese Panna Cotta with Candied Peppered Cherries. Finally, come cocktail hour, kick back and indulge in a Frozen Peach Margarita with Murray River Salt or a shot of Pepper & Lemon-infused vodka. Be amazed as these flavors mingle in your mouth never look at your salt and pepper in the same way again!